Given the high altitudes at which it works, ITBPF is exposed to high-velocity storms, blizzards, avalanches and the hazards of extreme cold. The force braves these extreme weather conditions to secure India's northern borders. It checks trans-border immigration, smuggling and crime and provides a sense of security to the local population. It also represents India internationally in strife-torn countries like Kosovo, Western Sahara, Sudan, Afghanistan, and Bosnia and Herzegovina, to name a few. Besides this, as the first response team for natural disasters in the Himalayas, ITBPF does remarkable rescue and relief work, as witnessed in Uttarakhand during the June 2013 flash floods. 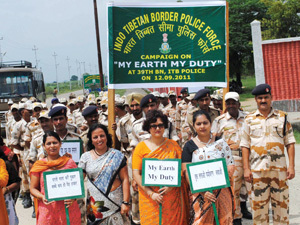 The Himveer Wives' Welfare Association (HWWA) is an independent arm of the ITBPF which works towards the overall betterment of the force’s personnel and their families. It is registered under the Societies Registration Act, 1860. The association organizes medical camps and spreads awareness about family planning, health, AIDS, hepatitis, among other issues. It also conducts activities themed on ecological preservation, like planting saplings, for instance. HWWA also trains the wives of ITBPF personnel in various vocational skills. Visit the ITBPF website in to know more about their work.